Frequency modulation (FM) is a form of modulation which conveys information over a carrier wave by varying its frequency (contrast this with amplitude modulation, in which the amplitude of the carrier is varied while its frequency remains constant). In analog applications, the instantaneous frequency of the carrier is directly proportional to the instantaneous value of the input signal. This form of modulation is commonly used in the FM broadcast band. A signal modifies the frequency of a carrier in FM. Edwin Howard Armstrong (1890–1954) was an American electrical engineer who invented wideband frequency modulation (FM) radio. He patented the regenerative circuit in 1914, the superheterodyne receiver in 1918 and the super-regenerative circuit in 1922. He presented his paper: "A Method of Reducing Disturbances in Radio Signaling by a System of Frequency Modulation", which first described FM radio, before the New York section of the Institute of Radio Engineers on November 6, 1935. The paper was published in 1936. As the name implies, wideband FM (WFM) requires a wider signal bandwidth than amplitude modulation by an equivalent modulating signal, but this also makes the signal more robust against noise and interference. Frequency modulation is also more robust against simple signal amplitude fading phenomena. As a result, FM was chosen as the modulation standard for high frequency, high fidelity radio transmission: hence the term "FM radio" (although for many years the BBC called it "VHF radio", because commercial FM broadcasting uses a well-known part of the VHF band—the FM broadcast band). FM receivers employ a special detector for FM signals and exhibit a phenomenon called capture effect, where the tuner is able to clearly receive the stronger of two stations being broadcast on the same frequency. Problematically however, frequency drift or lack of selectivity may cause one station or signal to be suddenly overtaken by another on an adjacent channel. Frequency drift typically constituted a problem on very old or inexpensive receivers, while inadequate selectivity may plague any tuner. An FM signal can also be used to carry a stereo signal: see FM stereo. However, this is done by using multiplexing and demultiplexing before and after the FM process. The rest of this article ignores the stereo multiplexing and demultiplexing process used in "stereo FM", and concentrates on the FM modulation and demodulation process, which is identical in stereo and mono processes. A high-efficiency radio-frequency switching amplifier can be used to transmit FM signals (and other constant-amplitude signals). For a given signal strength (measured at the receiver antenna), switching amplifiers use less battery power and typically cost less than a linear amplifier. This gives FM another advantage over other modulation schemes that require linear amplifiers, such as AM and QAM. FM is commonly used at VHF radio frequencies for high-fidelity broadcasts of music and speech. Normal (analog) TV sound is also broadcast using FM. A narrow band form is used for voice communications in commercial and amateur radio settings. 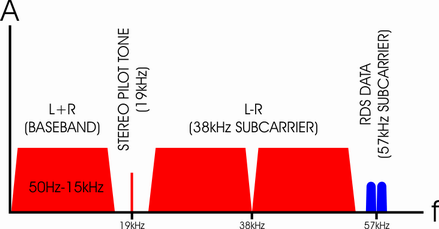 In broadcast services, where audio fidelity is important, wideband FM is generally used. In two-way radio, narrowband FM (NBFM) is used to conserve bandwidth for land mobile radio stations, marine mobile, and many other radio services.